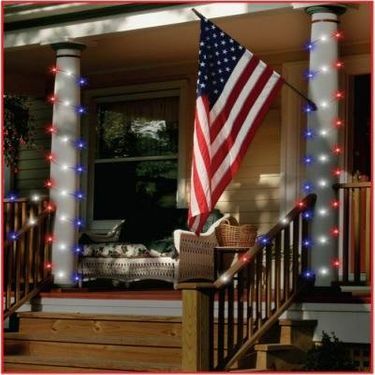 Solar Powered LED string lights are an ideal solution for all of your patriotic holiday and party decorating ideas! Our string lights are suitable for outdoor use as they are weather and water resistant. Now you have the freedom to decorate in trees, around posts, around doors and even on your roof because there are no electrical cords to deal with. Each set of solar powered string includes 50 LED lights and features the option of "Steady On" or "Multiple Blinking" modes, and turns on at dusk and off at dawn..
Comes complete with LEDs, Solar Panel and mount.